Have your company details and logo embroidered onto one of our Personalised golfing gifts. Our Tri-fold velour golf towels with logo is a 650g towel with brass eyelet and chain, includes up to 5000 stitches of embroidery. Colours include pink, burgundy, green, royal blue or white. Then hand them out to your customers as a promotional or Christmas giveaway. It's a stylish promotional gift. 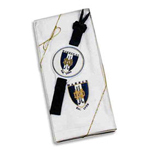 Your customers will adore our Tri-fold velour golf towels with hand embroidered logo, strengthening your corporate identity and giving you the edge over your competitors. Size:50 x 44cm. Advertise your companies details on our promotional Golf merchandise, then give them out to your customers on the golf course. Everybody likes a keen golfer. More Personalised golf merchandise here at C L Promotions. Personalised golf balls. All Personalised golf balls are high quality golf balls printed with your design and delivered in a presentation box. So advertise your business details this year on our Personalised golfing gifts, and stay one step ahead in advertising your business. Other promotional and personalised items besides our Personalised golfing gifts click here. For more information about our Personalised golfing gifts please click here and fill in the contact form and we'll get straight back to you.